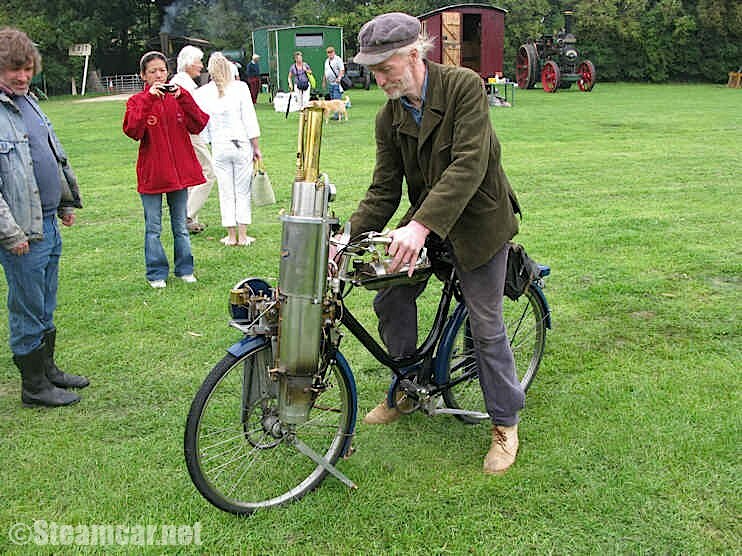 Many visitors to the Great Dorset Steam Fair (29th August - 2nd September 2001) were intrigued by the first appearance of my steam bicycle, after several years of eager anticipation. 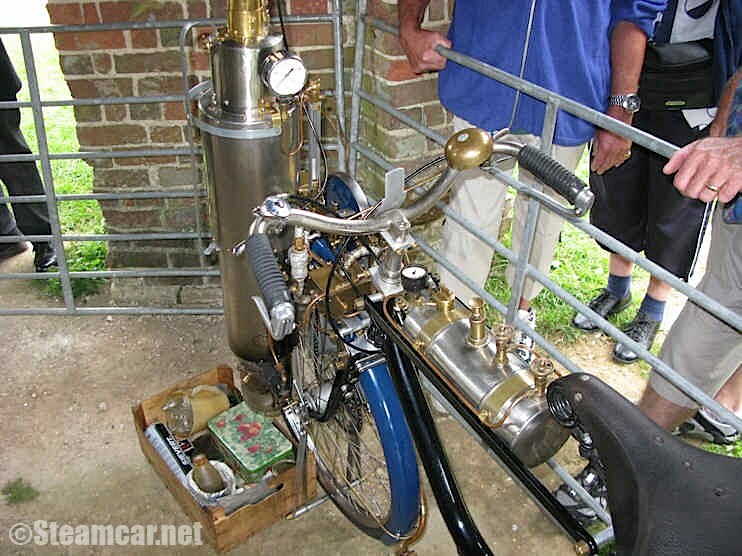 It all began in 1972 when I first had the notion of making a steam bike, thus combining my interest in cycles and motor cycles with my fascination and love of steam. 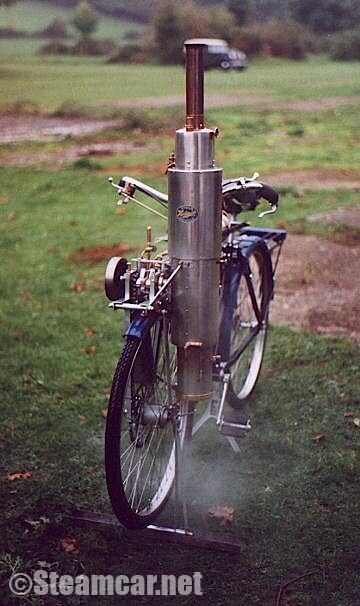 I realised that in order to be able to see the water level, the boiler and engine would have to go in front of the rider. I experimented using a pannier bag loaded with four house-bricks hung from the side of a rack, mounted over the front wheel of a bicycle. Finding that I could still ride OK, providing the load was rigidly fixed, I designed a tall, narrow boiler, to keep the centre of gravity as close in to the wheel as possible. The next few years were spent obtaining the materials and means of making the boiler and it took me until 1989 to complete it in its initial form. It is a semi-flash type, having a lower section of concentric spiral water tubes fed by a central down column, surmounted by a fire-tube header which has 24 × 3/8" flues in a 4" diameter, copper cylindrical shell. The whole assembly is silver soldered throughout, and contains less than 1 litre of water in total. The boiler is fired from below by a pressure-fed paraffin burner of the Optimus type. 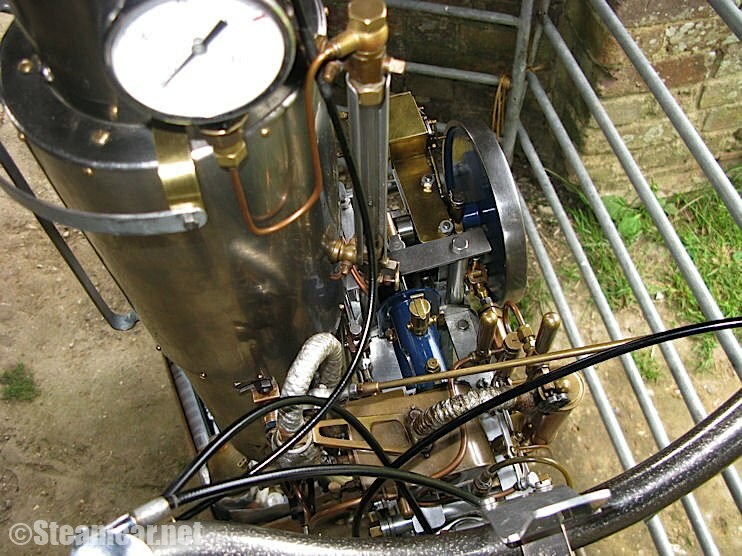 I thoroughly tested and gradually improved the boiler by driving engines belonging to my friend, Albert Crittell, whom I met at a steam rally in 1987. He gave me much encouragement, and some materials that I used in making my own engine, which was finished in its basic form by 1994. 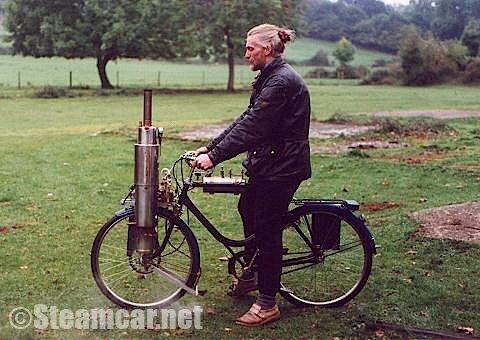 The engine is a horizontal single-cylinder, double-acting one of my own design. 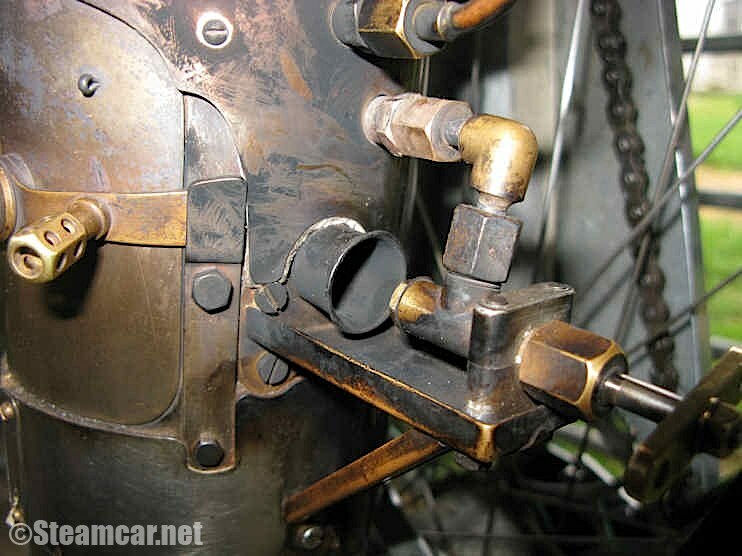 The bore is 1 3/8" and the stroke is 1 1/4", giving about 1/4hp, depending on the pressure of the steam. I ran and exhibited the engine and boiler for several years as a stationary unit driving a 12V dynamo. 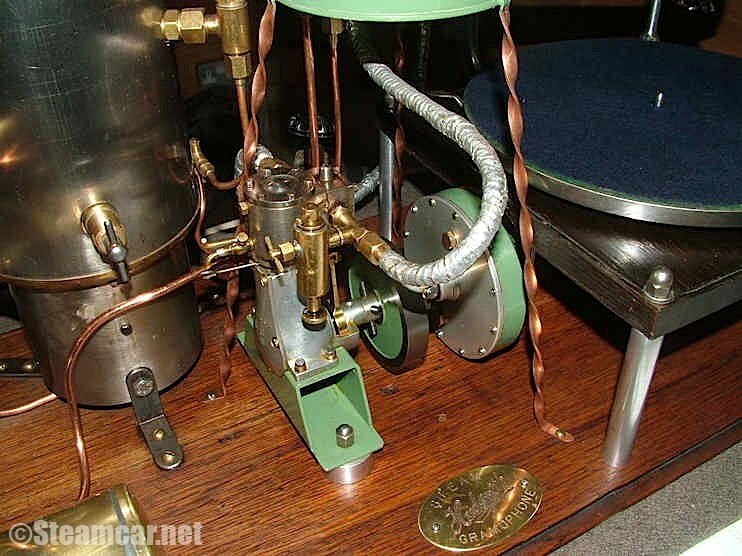 During this period I made several improvements to the engine, eg: making a boiler feed pump driven by an eccentric on the crankshaft, and controlled by a by-pass valve to the right of the engine. About 1989, I obtained a 1949 VéloSoleX premier type frame in a derelict and red rusted condition, and gradually set about restoring it, building new wheels, etc, to form the basis of the steam bike. I made twin top bars to support the paraffin tank and strengthen the swan-neck frame. 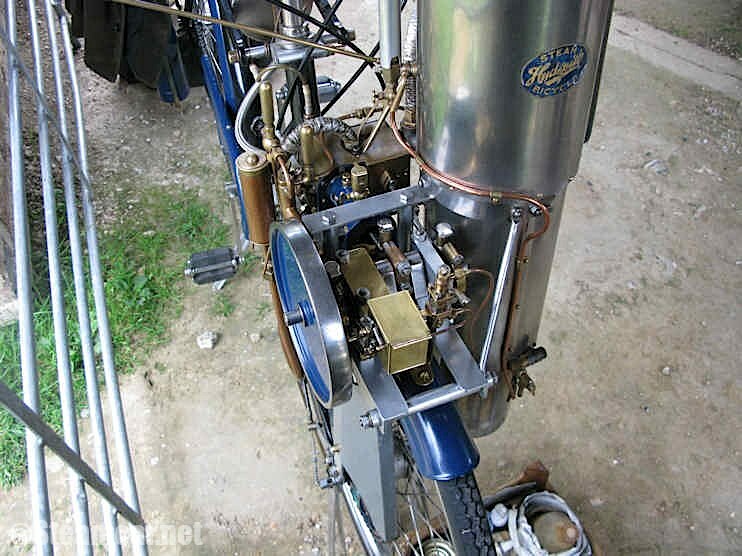 The engine is pivoted from the fork crown to allow the front forks to flex in the normal way, and the chain tension is kept constant by struts down to the front wheel spindle. The transmission chain runs from the crankshaft sprocket to a chain wheel, filed out to fit a Sturmey-Archer 3-speed AW hub, giving a ratio of 5.33:1 which can be increased by 33% or lowered by 25%. Also, I have a neutral position between 2nd and 3rd gears, by using a friction lever to control the gear cable. This is useful for warming up the engine initially, and for stating and stopping. 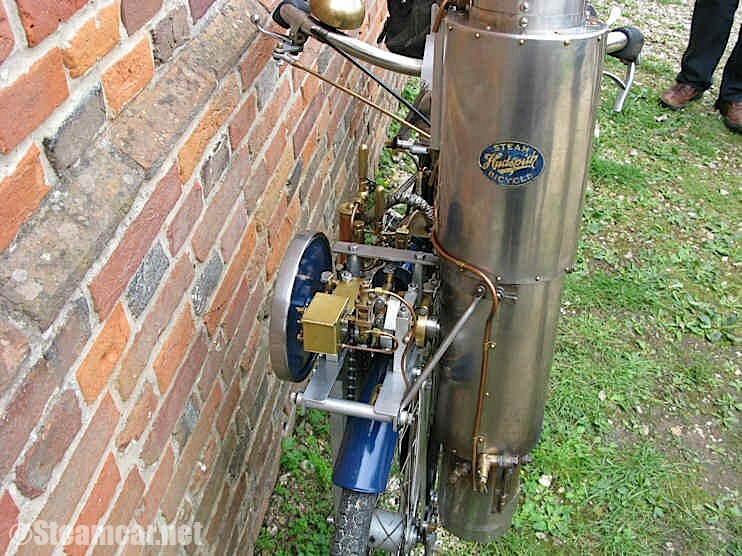 Steam Bicycle is ticking over in neutral after a ride. The weight of the boiler is largely counterbalanced by the weight of the flywheel, transmission and water pump, etc, and the water tank on the rear right hand side when underway. It is only ever a problem when lifting the machine up or down the stairs to my first floor council flat, single handed, when the front end tries to flop over to the left all the time. 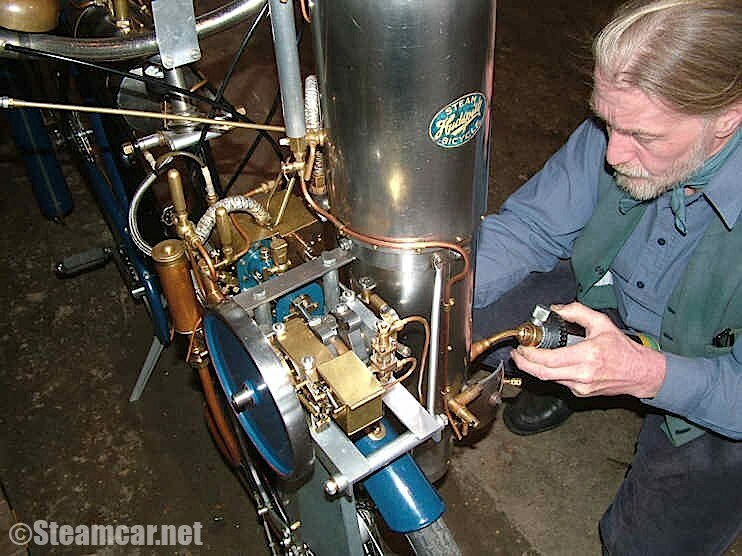 To start, after raising 100psi steam pressure (which takes 15 - 20 minutes from cold), I pedal off with the engine ticking over in neutral, then slip her into gear and open the regulator. It is possible to change gear by easing off the steam to allow the machine to over-run the engine speed, then of course opening up in the new gear. To stop, I can either just close the regulator, and coast to a halt, or ease it back and put her in neutral, leaving the engine ticking over. She will climb most main road hills in top gear, maybe with a little LPA if the pressure drops too much. At present (this winter) I am making an improved burner of my own design that will, I hope, give about half as much heat again as the Optimus does and also be more reliable. The Optimus, in fairness, was never meant to burn in an enclosed firebox, and thus it tends to puff out at times, which is a nuisance. The new burner should improve the performance by enabling the machine to run at full pressure all the time, which in steam terms is more efficient. 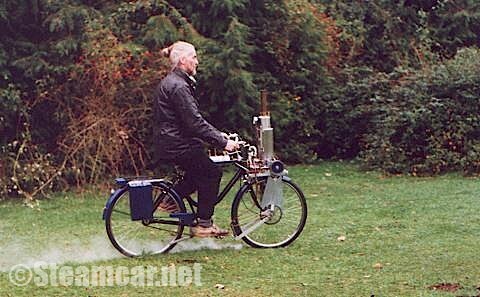 Present performance is about 8mph sustained speed, 6 - 8mpg of water and about 60 - 70mpg of paraffin (at a guess). Such a machine is never truly finished, and most times I run it, I think of an improvement to make for next time. After all, it has only taken me 30 years so far! 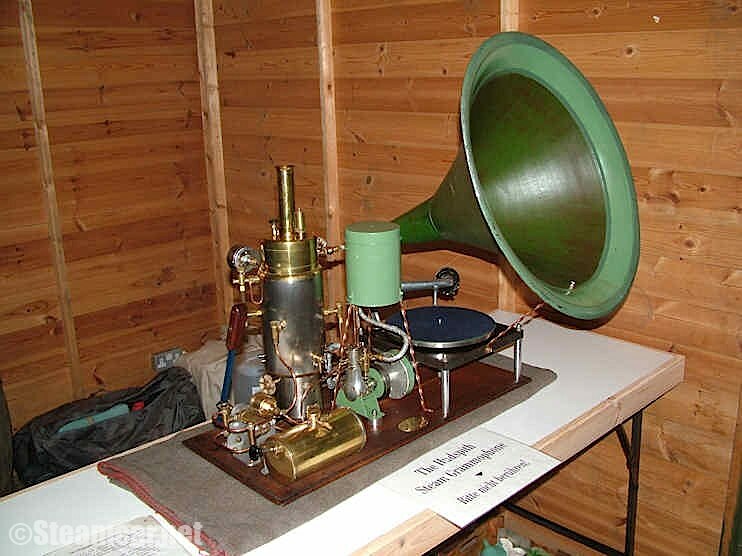 Below are a number of pictures of the bike, and two of Geoff's Steam Gramophone.